Lately in my coaching work, the conversation has circled to supporting students with special needs within the reading and writing workshop. The wonder and the difficulty of workshop teaching is the ability to differentiate within any day. It is amazing. It is daunting. Let’s buckle up and talk some practical tips for managing many goals within one classroom. First, remember workshop teaching is a structure, not a curriculum. What you do inside these structures depends a lot on what your kiddos need. Second, separate programs from practices. Remember goals may also not have anything to do with content. I often quote a math consultant I worked with, Ryan Dunn, who taught me that each lesson should have a social goal, a language goal, and a content goal. 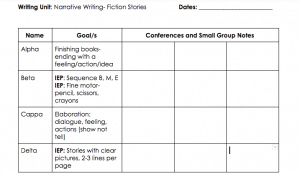 This is helpful to keep in mind in knowing that I may not work on a writing goal within a writing workshop, I might work on a social goal using our writing partner time. Here is the mental equation I do: what instructional practices should I use within the workshop structure to help children reach their goals? Listen, truth talk. I planned the lesson because it would be helpful to 75% of the children. When I teach the lesson, my eyes might be focused on 3 or 4 kiddos. This isn’t true for every lesson, but its true for some. Kathryn Cazes changed everything I understand about the world of independent work time when she taught me about schedules. You can read about her thinking in detail and see lots of examples and photos here. In summary, everyone doesn’t have to do the same thing in independent work time. Children don’t even need to spend their time the same way in independent work time. I used to send everyone off to work on their writing and their reading and think the differentiation was in the materials, but Kat taught there is so much more we can do: we can differentiate time amounts, we can differentiate skills we practice, we can differentiate size of groupings. In reading workshop it could be a child is working on sight word game on an iPad to meet a goal around word recognition, then moving to listening to a book on tape, then meeting with a teacher for direct instruction around phonics in a small group of children who require the same phonics program, and then finally spending the last bend of time reading from a book baggy with a partner. Maybe part of the child’s reading baggy is social stories they have read again and again as part of their social learning. It can feel like a lot to manage, the same way cooking a meal the size of Thanksgiving can feel daunting- multiple timers, multiple cooking temperatures, not enough space… but you manage it just like you do for that meal: plan, prepare what you can in advance, and then stay focused. Once you build a schedule for a child, and work towards independence with the child, you actually ease your work load. You know the child is engaging in work essential to their growth towards goals in a way that is appropriate for that child’s learning style and temperament. Gone are the days of constantly moving children away from each other for focus, or spending the last 20 minutes in a constant state of redirection. Instead you have adapted the structure to fit the child, and not forced the child into the structure. In no way shape, form, or universe am I suggesting this is easy, but it does get easier. In my last year as a classroom teacher, the oh so distant 2017, I was teaching kindergarten. 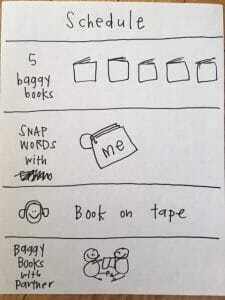 Within my classroom I had 4 kids on specialized schedules for reading or writing workshop. Teaching the children the schedules took a little less than a week. The children had bins and timers, visual schedules, and practice. These four children had been on my mind and had basically no choice but to distract others because I wasn’t using their time well. I was filling their time. Once I made the commitment and shifted each child into a personalized schedule, everything ran smoother. How do you make it work? Put thoughts and questions in the comments below! I love this for so many reasons. I need to push myself to differentiate independent time more. Right now I feel like it’s during small groups I do this, but there are more (and better) ways! Thank you for making me think deeper.